Mercedes scored a sweeping, dominant victory during the first race of the 2019 Formula One World Championship season. Despite to the expectations, Ferrari, the favourite team after the pre-season testing, experienced a shocking fourth and fifth finish, suffering from uncompetitiveness both it terms of one-lap and race performance. The first race of the season always brings an additional pressure, tension and insecurity. After analysing their own and the rivals' performances, each team arrives with a picture in its mind to the first race of the season. After this winter's pre-season testing, teams and experts suggested that Ferrari were the dominant force while Mercedes still had lots of homework to do, especially with their balance issues. Such a clear consensus inside the F1 community is a true rarity. The reigning world champion Lewis Hamilton even claimed that Ferrari's advantage might be around five tenths of a second. However, come to the first race of the season, as soon as the brand-new cars took it onto the track at Melbourne on Friday, Mercedes showed a complete, shocking turnaround with its form, topping all three free practice sessions, before cruising to a demoralizing front row lock-out in the qualifying session and scoring a double victory by a deficit what could be described as a country mile. What did the season-opener disclose about the pecking order? To answer it in a simple way: Mercedes seems to be able to continue its dominant for the sixth consecutive year and could be on the way to clinch both world championship titles for the sixth time in a row. Ferrari and Red Bull won't give it up at the very start of this long season, though. Not only the rivals kept on praising Ferrari’s pace, the Scuderia itself often sounded bullish by claiming that its SF90 has a strong basis and an extremely good balance. However, that was all lost on the dirty and slowish Melbourne street circuit. Both drivers of the Maranello-based outfit said that the car did not have enough grip and it gave no confidence to them. “At the start, the car was not so easy to drive and that led to me making a small mistake at the first corner, which cost me a handful of seconds,” said Leclerc. Ferrari’s new team principal Mattia Binotto conceded that his team did not find the right setup on Friday and they could not find the right balance despite to the intensive setup work after the practice sessions. "Right from Friday, we didn’t feel comfortable at this track. Even though we did a lot of work on set-up, we didn’t find the right balance and even our qualifying performance demonstrated that we were struggling to adapt to the Albert Park track." According to Vettel, his team has created its own homework before the field descends in Bahrain in a fortnight’s time as the Maranello-based outfit has to work out to regain the balance for the SF90. Mercedes had the upper hand not only considering the overall race time, but also in terms of fastest race lap. 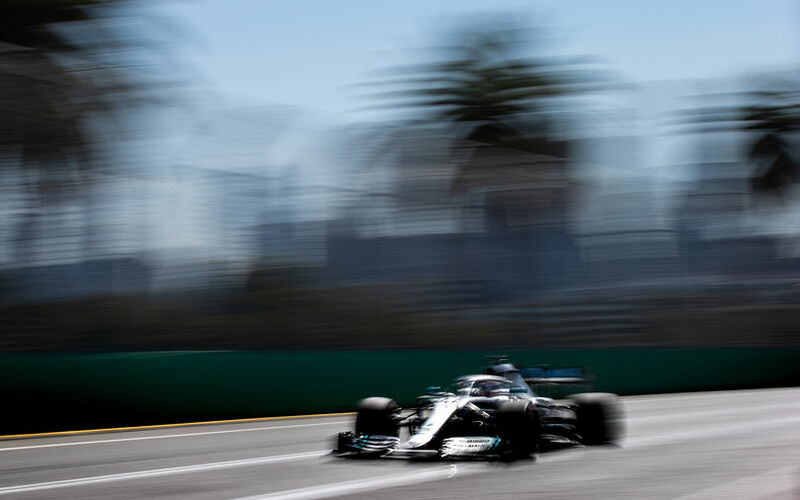 Valtteri Bottas was 0.477 faster than his team-mate Lewis Hamilton, albeit the comparison is not fair because the Finn’s C3 tyres were eight laps fresher. 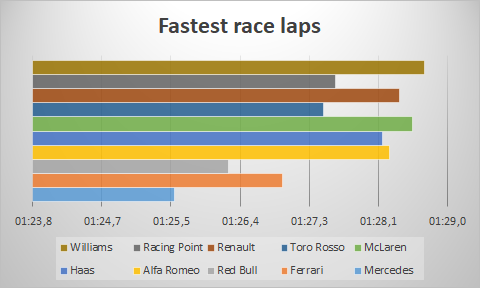 Due to the new rule, which presents the driver with the fastest race lap with a championship point providing he finished the race inside the top 10, the race-leading drivers made a late attack for the best lap time. 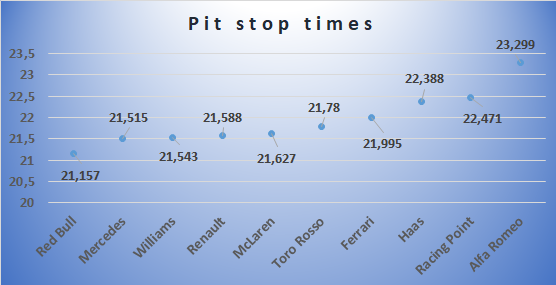 Bottas, Hamilton and Verstappen all set their best laptime on the 57th lap of the race while Ferrari’s Charles Leclerc a lap later, on the ultimate round of the race. While the top three were driving on Pirelli’s C3 compound, the Monegasque had the harder C2 compound on his SF90. Interestingly, Sebastian Vettel set his fastest laptime on the 16th on C3 in the second lap of his second stint with very high fuel load, highlighting the struggles of the German on the yellow-marked compound in the second half of the race. Dismissing Daniel Ricciardo and Carlos Sainz who both retired early from the race, Williams also finished at the bottom of this rank. Their deficit to the midfield pack might look smaller, but that is because both Russell and Kubica were on a two-stop strategy. Despite to the hard work on the pitstops, many teams were still a bit rusty during the season-opener when it came to the pitstop performance. Red Bull changed the tyres on Max Verstappen’s car in an impressive time, leading to the shortest stay in the pit lane. The Dutchman spent 21.157 seconds in the pit including his pit stop. Second in this list was his team-mate Pierre Gasly with a time of 21.269 seconds, highlighting Red Bull’s incredible work during the pit stops. Among the teams, Mercedes produced the second shortest time in the pit lane. Ferrari had two slowish stops which saw both its drivers losing time during the single pit stop. 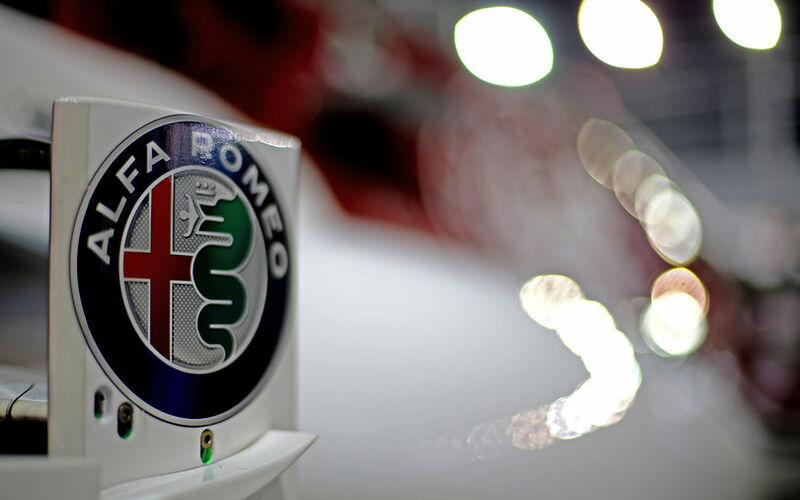 Alfa Romeo was the team with the slowest work during the tyre changes, both Kimi Räikkönen and Antonio Giovinazzi lost valuable time comapred to their closest rivals, Renault, Haas, McLaren, Racing Point and Toro Rosso. 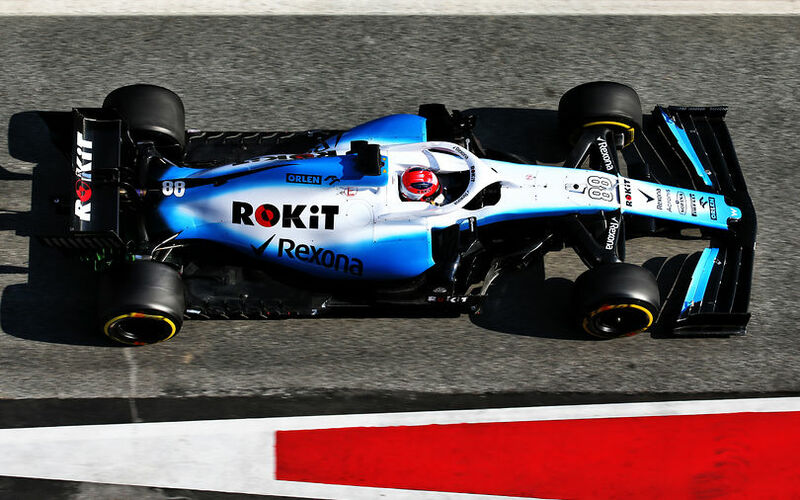 George Russell finished 16th and Robert Kubica 17th in the Australian Grand Prix . The Briton had a clean two stop race, boxing on Lap 26 for the soft Pirelli tyre and for the hard on Lap 42. After contact at turn one Robert picked up damage which compromised his afternoon having to pit for a new front wing. He continued to drive a solid race making two further pitstops for the soft Pirelli tyre on Laps 28 and 44. “I feel happy that I brought the car home with no dramas. I physically feel fine and it was a good first race from my side but obviously it is disappointing that we are so far behind the pace. We have got a lot of work to do tomorrow to understand and hopefully improve from there. I am not interested in fighting Robert for last, we need to work together to make this right,” said Russell. “It definitely wasn’t an easy race and we knew that before the start. We opted to start on the hard tyre to get experience on them but, I got a good start for those tyres. In turn one, I was on the inside and on the exit of the corner one of the Red Bull’s moved right to avoid another contact and we touched, damaging my front wing so I had to come in to box. Additionally, on lap three, I lost one of my mirrors, so the blue flags weren’t easy,” said Kubica. Haas F1 – points for Magnussen, nightmare for Grosjean. Rich Energy Haas F1 Team driver Kevin Magnussen delivered a strong points-paying performance Sunday in the season-opening Australian Grand Prix at Melbourne Grand Prix Circuit by finishing a best-of-the-rest sixth in the 58-lap race around the 5.303-kilometer (3.295-mile), 16-turn track. Teammate Romain Grosjean was unable to join Magnussen in the points, as a loose left-front wheel ended his race after 29 laps. “I don’t know what happened exactly yet. It just felt wrong. It’s not been a good day. Before all that I was happy and up behind Kevin. The new rules are great for following another car, but the tires are still what they were last year, as you push, you slide, then you lose grip” said Grosjean. “I’m very happy about today, it was a good result. I’m obviously sad for team not to have both cars get to the finish. Surely Romain (Grosjean) would have been in a good position as well, especially after we both had such good qualifying yesterday, so I’m gutted for his side that they didn’t get anything out of today. P6 for me is very good, I’m happy with the day. I made a good start and had a really good car from there. I was able to push the whole race and look after my tires,” said Magnussen. McLaren endured mixed emotions in the Australian Grand Prix today with Lando finishing a creditable 12th on his Grand Prix début, while Carlos retired from the opening round of this year’s FIA Formula 1 Championship. “It’s been a weekend to forget. I think we lost the MGU-K, which was a shame as the race was going well. I’d put yesterday behind me and I was feeling positive going into today. I’d done everything I wanted to do: I made a good start, overtaking four cars, getting in the fight for the points and starting to attack the cars in front. The car felt good, we had strong pace”, said Sainz. "The team gave me a good car, with enough pace for me to be in the top 10 but I made a couple of mistakes which cost me any chance of scoring points, so I’m a little disappointed. But it’s cool to finish my first race and get it out of the way. I didn’t make the perfect start, struggled to get ahead of a slower car and then had a big lock-up so I need to work on these mistakes. I’m annoyed with myself as there was more potential. Now I focus and look forward to Bahrain,” said Norris. “I’m disappointed to come away from Melbourne missing out on points. It was quite a difficult race for me from lap one because I made a poor start and lost a couple of places before turn one. Overtaking was extremely difficult, so we tried the undercut with the strategy but it didn’t really work out for us. After my pit stop I was stuck in traffic for the rest of the race. I was able to get ahead of Albon, when he made a mistake, but apart from that it was difficult to really show our pace,” said Perez. “I am very happy for the Team and also for Honda to finish on the podium today. To be able to challenge Lewis at the end of the race and overtake Seb on-track, which around here is very difficult, is very positive. We had a little advantage with the tyres but it was satisfying to pressure Lewis even though I couldn’t get quite close enough to overtake him. The car was working really well and we also look strong on the straights which is hopefully a good sign for the rest of the season. I heard this is the first podium for Honda since 2008 so I am very happy that I managed to achieve this for them today,” said Verstappen. “It was an excellent race today! I’m happy with the way I drove and it was really enjoyable. We had good tyre management throughout the race and we definitely had the pace to fight for higher positions but, as we know, it’s difficult to overtake around Albert Park. I tried to catch Stroll, but I was a bit on the edge and I couldn’t make it. I had a good battle with Pierre towards the end of the race, I felt like I could fight him well and at the end it was satisfying to keep a quicker car behind almost the whole race,” said Kvyat. Renault F1 Team began the 2019 FIA Formula 1 World Championship with a solid points finish courtesy of Nico Hülkenberg’s seventh place in the Rolex Australian Grand Prix at Albert Park, Melbourne. Hülkenberg made an excellent start from eleventh on the grid, rising to eighth on the opening lap before driving a conservative race to the flag in seventh place, a repeat of the result recorded in Australia last season. “It’s a good start to the season with some solid points on the board. It was a tricky race – especially the final 10 laps – I was under pressure and really had to fight to hang onto seventh place. I’m pleased to pull that off. The start and the first lap made our race; it’s so crucial to have track position around here and from there it was about managing the car and the tyres,” said Hülkenberg. “I’m gutted, that’s for sure. I made a good start, managed to get a good run on Perez and then moved to the side. I put a wheel on the grass, which didn’t concern me, and then a massive bump caught me by surprise. It’s unlucky more than anything and, unfortunately, that was our race run there and then. It all happened very quickly and it was a shame we finished like that. Nico showed in the race that the car belongs in the top eight,” said Ricciardo. Mercedes-AMG Petronas Motorsport start the 2019 Formula One season with a 1-2 victory. Bottas took his fourth career victory today. Bottas finished in second place, completing a perfect start to the season for the team. “This feels so good – I don’t think I’ve ever had a race like this! We could not have asked for a better start to the season – getting maximum points for the team is a perfect result and we couldn’t be happier. It’s also an important result for me personally, I’m really pleased with how the race went. These things don’t just happen – both the team and I have worked hard for this and it seems like the hard work paid off today. The key was the start; I think Lewis may have had a bit of wheel spin, so I was able to take the lead. My race pace was really strong, I could pull away and build a gap.” said Bottas. “It was an incredible weekend for the team, we’re leaving Melbourne with maximum points. Valtteri did an exceptional job today – congratulations to him. I had a pretty straightforward race today; I lost position at the start and my race was pretty much done and dusted after the first corner. Afterwards it was really about bringing the car home and bagging the points. I had to pit early to cover the pit stop from Ferrari, so I had a long second stint and drove super carefully to make sure I had tyres left at the end of the race,” said Hamilton. Kimi Räikkonen finished the season-opening Australian Grand Prix in the eighth place while his team-mate Antonio Giovinazzi had to complete his third F1 race with some damage on his Alfa Romeo. “Our car was pretty strong in the race, but then we got stuck behind cars and there is not much you can do. It seems that it is easier to get closer to the car in front of you but it’s still very hard to overtake. In addition, we had an issue with the temperature of the rear brakes as one of the tear-offs from the visor went in and that’s why we had to pit earlier than planned. But as I said, the car has a lot of speed and it felt good, so I’m looking forward to the race in Bahrain,” said Räikkönen. “It was a tough race. I picked up some damage to my car on lap 1 and after that it was challenging to stay up to speed. There were some battles and I did my best to defend my position. It was only the first race of the season, so I look forward to fighting for a stronger result in Bahrain,” said Giovinazzi.